Musa Capital’s experience as private equity investors, business owners, and owner investors enables us to see advisory assignments from both a client’s and an owner’s point of view, which assists us in providing sound financial advisory services in South Africa. We have close personal insight into – and an intuitive grasp of – the strategic solutions and transaction structures needed for business growth. Inherently, therefore, we are able to develop creative deal structures or financing vehicles that solve the most intractable of client problems. When other institutions see only problems, we ask “why not?” and then execute. Musa Capital has been an independent investment advisor since the creation of the firm in 1995. Not being affiliated with a large bank or financial institution allows us to tailor solutions for clients without incurring a conflict of interest. In addition, our global network of corporate, government, and institutional partnerships and relationships gives us, and our clients, access to unsurpassed resources from around the world. Musa Capital is an independent non-affiliated boutique advisor to African entrepreneurs, sovereigns and African-focused investors. The trust of clients is paramount for Musa Capital , and we are reputed for always acting with discretion and absolute confidentiality. 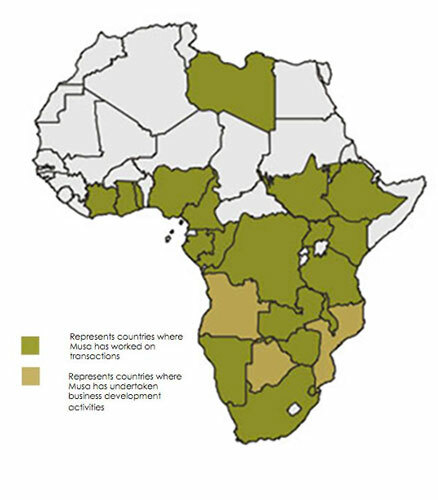 Musa Capital has senior bankers with, on average over 20 years of investment banking experience gained globally and throughout the continent transacting in over 20 African countries. Musa Capital is determined to identify solutions and has an internal culture that fosters a spirit of debate and creativity that leads to solutions fuelled by progress, passion and partnership. Musa Capital is a firm that retains an entrepreneurial spirit that enables it to solve problems and always find solutions to difficult financial challenges, with groundbreaking speed, when appropriate.